Stage hypnosis is 100% safe when practiced by a certified professional with an understanding and experience in presenting a safe show. 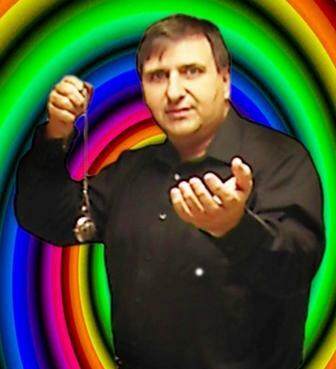 Hypnotist Rich Alexander is professional, fun and entertaining. He hypnotizes willing volunteers and then makes "stars" out of them. All WITHOUT EMBARASSING ANYONE! It's good, clean fun and completely safe. The show makes use of audience participation, music, sound effects and stage lights. The show starts with a brief explanation of hypnosis and some fun demonstrations that gets the audience excited to be in the show. The volunteers that want to be in the show are then invited to come up. After the volunteers are seated, they are hypnotized and have the time of their lives, as they play in fun hypnotic routines that are not offensive. They experience playing musical instruments, milking imaginary cows, life as a goldfish and much more. They are the stars of the show. The skits will have your audience laughing hilariously, but not embarrass the volunteers. Witness people fall asleep at the snap of a finger - and maybe even become hypnotized yourself! Everyone (including you) will be entertained and amazed. Everyone has fun and leaves with wonderful memories of the show that will have them talking for days and thanking you for such a great time.